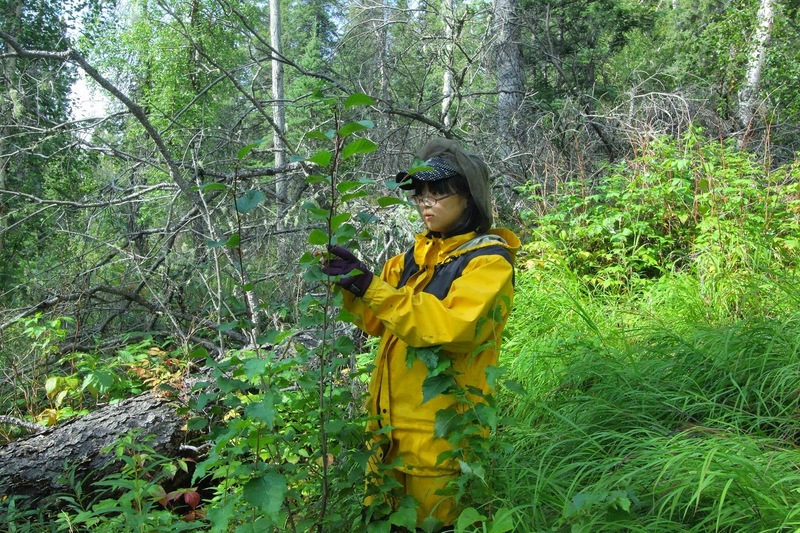 Ayana Nagamori learned how to determine the age of trees while serving an internship at the University of Alaska Fairbanks in August, but it is the mosquitoes she will remember the most. While doing field work for Professor Glenn Juday, Nagamori quickly learned how to suit up with rain gear, head net and bug spray to combat the pesky presence of the "Alaska state bird." Nagamori, a sophomore in applied bioscience at Hokkaido University in Japan, kept busy counting tree rings, measuring trees and doing data entry throughout her three weeks in Fairbanks. She went camping in Denali National Park and soaked in the healing waters at Chena Hot Springs Resort. She especially loved seeing the birds at Denali. Working with School of Natural Resources technician Ryan Jess, Nagamori was amazed that he could point out where there had been fire, competition or drought simply by observing the rings of a tree's core. She said one difference between Alaska and her home, Toyama, Japan, is that Alaska has only a few varieties of trees and Japan has multitudes. "We have many varieties of just pine trees," she said. In Alaska, the people are tolerant, Nagamori said. "I want to come back again to see the nature and landscape. I appreciate the people's kindness." Nagamori's career goal is to become a researcher. "I haven't decided what field yet but forestry is very attractive," she said. For fun Nagamori enjoys riding bicycles and singing karaoke. Jess said the exchange student fit into the forest sciences field team well. "We wanted to show her what a job like this would entail," he explained. "She had the opportunity to do everything from measuring trees to coring and going through the analysis process." Donna Anger, director of the UAF Office of International Programs and Initiatives, said the university has partnered with Hokkaido University since 1986. The new aspect is that she was asked to create short programs, including internship opportunities, for students of Hokkaido's Nitobe College, which helps students improve English skills while deepening their understanding of other cultures. "We're really excited about it," Anger said. "Having Ayana here and working with Natural Resources Management has been a good learning experience for everybody."